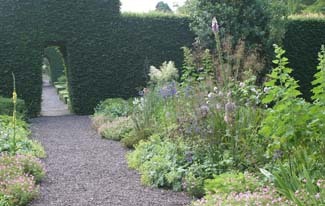 A recent garden with parterre, potager, herbaceous borders maze and shell house. 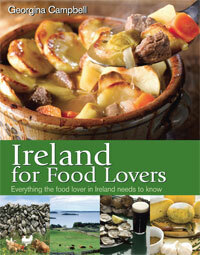 The gardens at Ballymaloe are delicious - traditional with an original twist, just like Darina Allen’s recipes. 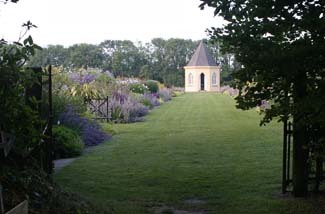 The first garden was made in the 1980s and, inspired by a the great French garden at Villandry, is laid out with a parterre of flower shaped beds filled with herbs and set in gravel surrounded by ancient beech hedges, the sole survivors of an earlier 19th century garden. A myrtle in honour of Myrtle Allen, founder of the Ballymaloe tradition, has pride of place in the centre of the garden. At the far end of the garden is a pond and a temple ingeniously made with the pillars of a demolished house. 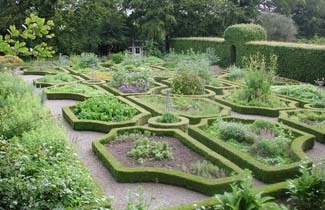 The garden has kept on growing one new area at a time, expanding to a potager planted with brilliant rows of vegetables planted in a pattern of squares and diamonds between herringbone brick paths. Edible flowers like marigolds and nasturtiums are used in salads or for garnishes in the restaurant, while leggy sunflowers and artichokes add to the colourful profusion. The octagonal Shell House - which is based on the similar 18th century follies, its interior richly decorated with cockle, mussel, scallops and oyster shells by Charlotte Kerr Wilson - became a wonderful excuse for a another garden: thus deep, double herbaceous borders filled with shades of blue, gold and silver with delphiniums, hemerocallis, crocosmia and artemesia now lead to the shell house. Nearby a yew maze in Celtic swirls, designed by Peter Lamb and Lesley Beck, is maturing. A fruit garden, designed by Jim Reynolds with gravel walks where the trees are underplanted with spring bulbs, links the cookery school to the rest of the garden compartments. And of course there is always a new scheme: an Irish apple meadow, an arboretum and a rose garden are all part of the evolving scheme of things Darina Allen. N25 to Castlemartyr, follow signpost for Ladysbridge/Shanagarry. In Shanagarry, turn right at the church (sign posted) for cookery school - located 1/4 mile up that road on the right.